In general, the regular audiences for most television and print news outlets tend to be older than the public as a whole. Yet there are some notable exceptions. As was the case two years ago, The Colbert Report and The Daily Show have the youngest audiences of the 24 news sources tested: 43% of Colbert’s regular audience is younger than 30, as is 39% of the Daily Show’s regular viewers. Just 23% of the public is 18-to-29. Regular readers of the New York Times also tend to be younger than average. Nearly a third (32%) of regular Times readers – are younger than 30. In contrast, political talk shows, particularly conservative talk programs, have older audiences. Large majorities of the regular viewers of Sean Hannity (66%) and The O’ Reilly Factor (64%) are 50 and older. Just 43% of all Americans are 50 and older. And while just 17% of the public is 65 and older, 42% of regular Hannity viewers and 40% of regular O’Reilly viewers are in that age category. Liberal talk show audiences also skew older, but not as dramatically. Still, among regular Hardball watchers, 59% are 50 or older, and 28% are at least 65. Among regular Rachel Maddow viewers, 57% are 50 or older and 25% are at least 65. Men dominate the regular audiences of the financial publications included in the survey: 73% of the regular readers of the Economist and Bloomberg Businessweek are men as are 71% of regular Wall Street Journal readers. Men also comprise smaller majorities of the regular audiences for several other news outlets, including Rush Limbaugh listeners (59%), viewers of Colbert (58%) and the Daily Show (56%), as well as regular viewers of Hannity (57%) and O’Reilly (56%). In contrast, women make up nearly three-quarters (73%) of the regular audience for daytime talk shows, such as The View or the Ellen DeGeneres Show. The regular viewers of MSNBC also are mostly women (62%). By comparison, the regular audiences for both CNN and Fox News are more evenly divided between women and men. Many regular news audiences have more education than the general public. And in general, regular readers of newspapers and magazines are more educated than the audiences of television shows or networks. Nearly two-thirds (64%) of the regular readers of magazines such as the New Yorker, the Atlantic and Harpers are college graduates, as are 63% of readers of the Economist and Bloomberg Businessweek. More than half of the regular readers of the Wall Street Journal (56%), New York Times (56%) and news magazines (53%) also are college graduates. NPR’s audience also is relatively well educated (54% are college graduates). Just 29% of all Americans are college graduates. By comparison, 29% of CNN’s regular audience, 26% of MSNBC’s audience and 24% of Fox News’s regular audience completed college. Regular viewers of daytime talk shows are less educated than the public as a whole. Among this group, just 19% have four year degrees, 26% have attended some college and 54% have a high school diploma or less education. There is a similar pattern when it comes to the family incomes of regular news audiences. At least four-in-ten regular readers of magazines such as the Economist (46%) or the New Yorker (41%), as well as regular NPR listeners (43%), have family incomes of $75,000 or more. Among the public, just 26% have family incomes of $75,000 or more. Other high earners include readers of the Wall Street Journal and New York Times—38% of each group has a family income of at least $75,000—and Daily Show and Maddow viewers (37% each). The income distribution of many audiences comes close to matching that of the general public, including audiences of show such as the O’Reilly Factor and Hardball, USA Today and network evening news. The income profiles of all three major cable news network audiences also closely track the general public. Daytime talk show watchers stand out as the least well off regular audience. About half (51%) have family incomes of less than $30,000, while three-in-ten have $30,000-$74,999 incomes. Just 12% have incomes of $75,000 or more. 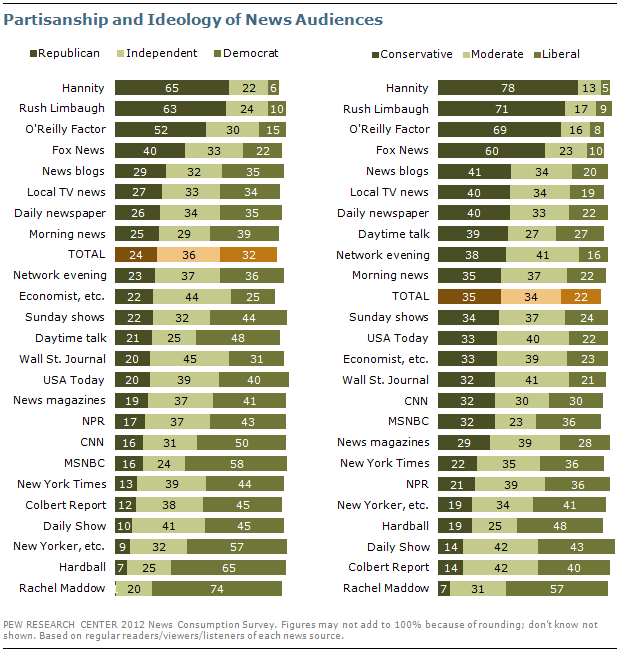 Since 2010, there has been little change in the ideological views or partisan leanings of news audiences. The regular audiences for Sean Hannity, Rush Limbaugh and Bill O’Reilly continue to be dominated by conservatives: About seven-in-ten or more of each of these audiences describe their political views as conservative, compared with 35% of the general public. And while Republicans comprise just 24% of the public, they make up half or more of the regular audiences of these three news outlets. On the other hand, the regular viewers of Rachel Maddow are mostly liberal (57%); this is the only news audience tested in which liberals make up a majority. Just 22% of Americans are liberals. Liberals also make up 48% of regular viewers of Hardball, 43% of Daily Show viewers and 40% of Colbert viewers. Majorities of the Maddow (74%) and Hardball audiences (65%) are Democrats, as are more than half of regular MSNBC viewers (58%) and regular readers of the New Yorker and similar magazines (57%). Among the public, just 32% are Democrats. Yet the regular audiences for a number of news sources differ only modestly from the public ideologically or politically. Many of the most popular news sources—network evening news, daily newspapers and morning news, for example—have audiences whose partisan and ideological breakdowns are fairly similar to the public’s. This also is the case for the regular audiences for Sunday morning news shows, business magazines, and both USA Today and the Wall Street Journal. A majority of Americans (55%) say they trust a few news sources more than others; fewer (42%) say the news media “are pretty much the same.” These opinions have changed very little since 2004. 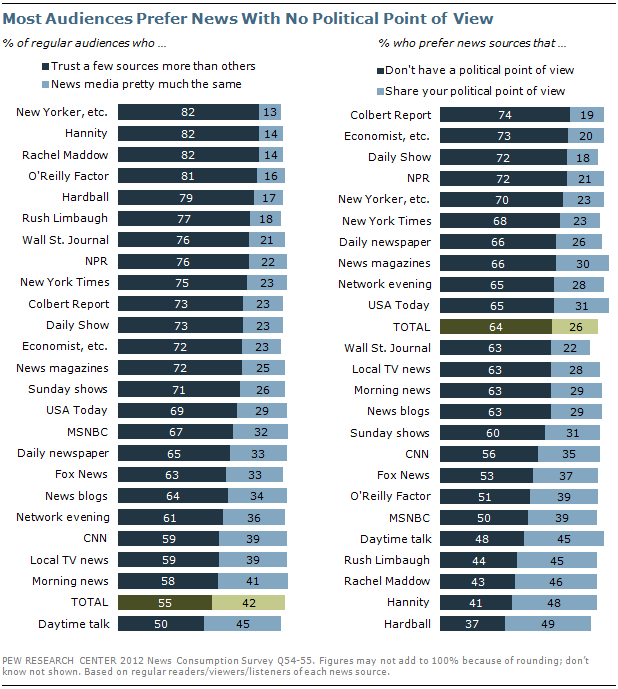 For the most part, regular news audiences are more likely than the public to say they trust a few news sources more than others. Fully eight-in-ten readers of magazines such as the New Yorker, Atlantic and Harpers, and Hannity, Maddow and O’Reilly viewers say there are a few sources they trust more than others. By contrast, just half of regular viewers of daytime talk shows trust some news sources more than others; nearly as many (45%) say the media are pretty much the same. A majority of the public (64%) also continues to prefer to get political news from sources that have no particular political point of view; just 26% prefer news from sources that share their political views. Majorities of most news audiences say they want news with no political point of view, including seven-in-ten or more Colbert and Daily Show viewers, Economist readers, NPR listeners and readers of the New Yorker and similar magazines. However, only about four-in-ten viewers of Hardball (37%), Hannity (41%), Maddow (43%) and listeners of Limbaugh (44%) say they prefer to get news from sources that don’t have a particular political point of view. The public was asked four questions to measure knowledge of political news and current events. The questions concern which party controls the House of Representatives, the current unemployment rate, the nation that Angela Merkel leads and which presidential candidate favors taxing higher-income Americans. Overall, just 14% of the public got all four questions right. Slightly more people (17%) got all four wrong. Most news audiences, however, scored substantially better than the public. Almost four-in-ten of Rachel Maddow’s audience (38%) answered the four questions correctly, as did 36% of readers of magazines such as the New Yorker and 34% of Wall Street Journal readers. Audiences for several other news outlets, including NPR (33% all four correct), the Daily Show (32%), Hardball (32%) and the New York Times (31%) fared nearly as well. The daytime talk show audience fared poorly on the knowledge questions, with just 4% answering all four correctly. Among this group, 18% answered none of the questions correctly. Slightly more than half the public (54%) knew that the Republican Party controls the House of Representatives. The percentage is down substantially from 2010, when 70% knew the Democrats controlled the House. This decline is reflected across most news audiences. About half the public (52%) also knew that the national unemployment rate is about 8%. Almost all regular audiences were at least as likely as the general public to get this question right. Just 22% of the public identified Germany as the country that Angela Merkel leads. Many audiences fared somewhat better on this question than the public as a whole, but most regular readers, viewers and listeners did not know this or offered no response. Two-thirds of the public knew that Barack Obama—not Mitt Romney—is more supportive of increasing taxes on higher-income people. Majorities of all news audiences answered this question correctly.